Looking up at the south facade from West 57th Street. 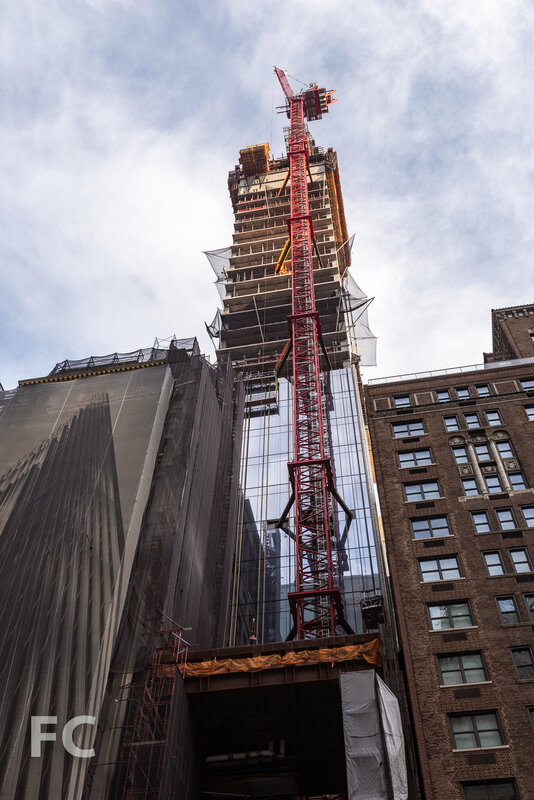 Construction is progressing at JDS Development Group's supertall Midtown residential tower at 111 West 57th Street. Designed by SHoP Architects, the 1,428-foot tower will offer 60 residential condos when it wraps up construction some time in 2019. Currently, concrete superstructure has surpassed the 30th floor and the terra-cotta, bronze, and glass curtain wall has been installed on about 10 floors. Close-up of the east terra-cotta and glass facade. Architect: SHoP Architects; Developer: JDS Development Group; Program: Residential; Location: Midtown, New York, NY; Completion: 2019.